-Oxy-Geneo™ by Pollogen is an innovative technology for skin exfoliation (removal of dead skin cells from the skin surface), improving skin oxygen levels and infusion of essential nutrients to enrich the skin. The simultaneous skin exfoliation along with skin oxygenation optimizes the absorption of the valuable components in our nutrient-rich gels into the skin. Oxy-Geneo™ capitalizes on the Bohr Effect that was discovered by Christian Bohr in 1904. The effect indicates that when the CO2 (Carbon dioxide) concentration increases, the hemoglobin releases oxygen from within. During the Oxy-Geneo™ treatment an interaction between the capsule and the treatment gel creates an abundance of CO2 bubbles on the skin that trigger the Bohr Effect to oxygenate the skin naturally. Through an exclusive Capsugen capsule the Oxy-Geneo™ exfoliates the upper skin layers to remove dead cells, smoothen the surface and stimulate the cell renewal, preparing the skin to receive active nutrients. The Oxy-Geneo™ is painless and safe on all skin types and colours and can treat sensitive skin without any irritation. The Oxy-Geneo™ Capsugen capsule simultaneously cleanses the skin and promotes an infusion of active ingredients from a nutrient-rich gel (NeoBright™ for skin brightening and texture improvement or NeoRevive™ for rejuvenation and anti-aging). The Oxy-Geneo™ interaction between the Capsugen capsule and the treatment gel creates abundance of CO2 bubbles on the skin that triggers the Bohr Effect that oxygenates the skin naturally from within. Oxygenation results in optimal absorption of active ingredients and is beneficial in all anti-aging and corrective skin procedures. NeoRevive™ completely redefines skin treatment. NeoRevive™ gel gently infuses healing and regenerating ingredients deep into the epidermis where they are optimally absorbed by the skin. Naturally produced by the body and responsible for fluid retention and skin moisturizing. As we age, the body’s capacity to product Hyaluronic Acid decreases. This results in thinner, dryer and wrinkled skin. By infusing Hyaluronic acid, the skin is able to regain lost moisture and volume, thereby reducing the appearance of fine lines and wrinkles. A derivative of vitamin A, Retinol has been clinically proven to increase collagen production and stimulate skin cell renewal. It is known as one of the best anti-wrinkle and anti-aging solutions. NeoBright™ is a ground-breaking solution that delivers unparalleled skin lightening and bleaching. NeoBright™ gel infuses advanced skin formulas deep into the epidermis where they are seamlessly absorbed by the skin. Azelaic Acid is a well-known agent that is used to treat skin hyper pigmentation conditions by decreasing the activity of pigment-producing cells. Kojic Acid is a naturally occurring agent which inhibits melanin (pigment) production. When combined with Azelaic acid, there is a synergistic lightening and bleaching effect. A derivative of Vitamin A, Retinol has been clinically proven to exfoliate the skin and increase collagen production. It is also known as one of the best anti-aging ingredients. How does the Oxy-Geneo™ feel? An Oxy-Geneo™ treatment feels relaxing and comfortable. More sensitive skin type clients may have a warm sensation on the skin during the first (exfoliating) part of the treatment. What should I expect to see and feel after Oxy-Geneo™ treatment? 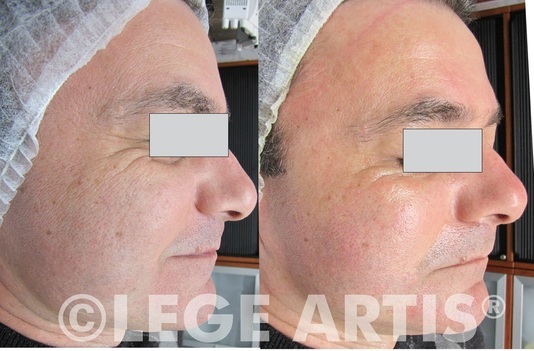 After an Oxy-Geneo™ treatment the skin will look smooth and glowing, feel fresh, soft and rejuvenated. If you have an upcoming event, schedule your Oxy-Geneo™ treatment on the day before and the effect will be well visible and lasting. How frequently can I have Oxy-Geneo™ treatment? To treat skin issues such as sun damage or acne, a series of once a week treatments are recommended. Scheduling an Oxy-Geneo™ treatment once a month is a perfect long term maintenance program. Consult your skin care specialist for a schedule that suits your individual needs the best. 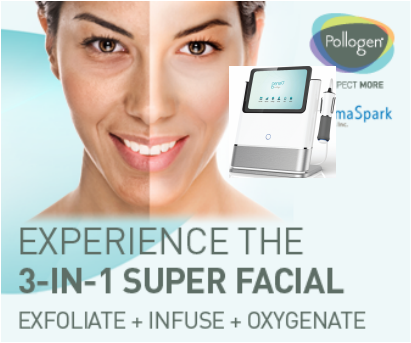 How does Oxy-Geneo™ compare to Microdermabrasion? Microdermabrasion exfoliates dry skin while Oxy-Geneo exfoliates wet skin which makes the treatment pleasant, relaxing and non irritating yet very effective. As microdermabrasion can be irritating, it is possible for a client with sensitive skin to experience some breakouts 3-4 days post treatment. Oxy-Geneo™ provides superior exfoliation with little to no irritation thus the possibility of subsequent breakouts is very rare. Oxy-Geneo™ exfoliates, oxygenates and infuses anti-aging and skin whitening active ingredients to the skin while microdermabrasion only exfoliates. The ingredients are always fresh as each treatment gel is vacuum sealed and new for each treatment session providing best results. The exfoliating Capsugen capsule is also disposable. 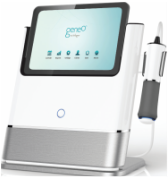 Because the Oxy-Geneo™ is a non-vacuum device, it is safe for use on sensitive skin types in capillary-rich areas of the face such as the nose, and on the sensitive skin around the eyes and mouth. Oxy-Geneo™ is a quiet treatment without the noise of the vacuum pump. Oxy-Geneo™ uses a large exfoliating capsule which makes the treatment more comfortable and treats a wide area at a time. Results after just one Oxy-Geneo NeoBright procedure. Note improved skin texture, increased hydration, reduction in the appearance of fine lines and periorbital wrinkles, brighter and clearer complexion. Do not use any type of abrasive on the area - no scrubs, loofah, exfoliating glove, etc. Be gentle when cleansing. As excessive perspiration may irritate the treated area, we recommend to avoid heavy exercises for 24 hours after the treatment. Consult with your skin care practitioner about how soon you can do another type of treatment if it is to be done on the same area - for example - laser hair removal, chemical peel, Vbeam laser, etc. Disclaimer: The information contained in this website is being provided for general information purposes only and is not meant to substitute in any way whatsoever for advice, medical care or treatment from a medical professional. Individual results may vary. Lege Artis Skin Care Inc. is not a medical clinic and does not provide diagnosis, medical treatments or advice. This web site has been prepared with great care. However, Lege Artis is not liable for correctness and/or completeness of the contents herein.